Why do birds flock to Central Park every spring and fall? 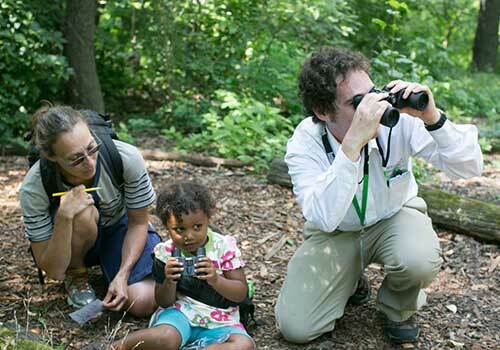 We’ll find out as we explore Central Park’s woodlands, and learn the basics of bird identification along the way! Bring your family for a guided walk and discover why Central Park is a sanctuary for plants, animals, and humans alike. Learn about the architecture, landscapes, and ecosystems of the Park through hands-on exploration using Discovery Kits – rugged backpacks filled with kid-friendly binoculars, field guides, and hand lenses. Pre-registration required as space is limited. Families with children ages 5+ only; no groups, please. Please arrive at walk location 15 minutes before the start of the Discovery Walk to allow time for check in and to pick up Discovery Kits. Terrain: Uneven, with hills, stairs, and wood-chipped trails; may not be suitable for strollers.